Take a look at what the reviewers are saying! Nice reviews, I can't wait to read your adventure. I really liked the book. Fortunately, the wait for the second instalment won't be long. :) Now, I'm considering buying 'Darkvision', since the new FRCG has a very interesting entry about Imaskar. Someone on the WotC forums mentioned Pandorym... and it reminded me of one question I wanted to ask you long ago (I have forgotten of course). Where in the new 4E cosmology does Pandorym come form? The Far Realm? What level would you give it? Pandorym, as I envisioned it when I wrote Darkvision, actually comes from a parallel universe, not the Far Realm. A version of Pandorym appeared later in Elder Evils, where even a shard of its essence was described as level 25. I'd go with that. The fully animate Pandorym..., well, it'd be tough enough to kill gods :-). 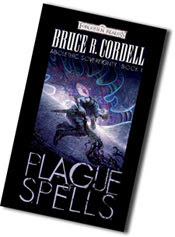 Plague of Spells Released Today!